ll of us experience major disruptions at certain points in our lives. In fact, this is an expected and predictable hallmark of the human condition. For some, these hard times come frequently – the impact of the trauma is overwhelming and recovery, if it comes at all, can be painfully slow. Others show resilience and are able to glide through these times fairly easily, bouncing back to a normal life again quickly. Resilience – the strength required to adapt to change – lies at the heart of mental and emotional health. Research studies in recent years have focused on the struggles faced by those who have been emotionally, sexually, and physically abused as children, as well as those who have grown up with learning disabilities and attention deficit disorders. They share in common many of the characteristics of those who have endured traumas later in life, such as war, the loss of a loved one, natural disasters, financial catastrophes, or a major illness. What has been most interesting in these studies is the finding that some traumatized people – both those with childhood abuse and other challenges, as well as those who experienced life disruptions in adulthood – suffer virtually no ill effects from the trauma. In fact, in many cases they seem to have grown stronger and led more integrated lives. This unexpected finding has guided researchers to explore the nature of resilience. I offer counseling for individuals, couples, and families. My mission is to help you find the solutions that will enhance your personal well-being. I am a dedicated psychotherapist with the experience and knowledge to meet your needs. My office is conveniently located in Mission Valley, with ample free parking. I offer convenient daytime and evening hours. Sally LeBoy, M.S., (MFT14768) is a licensed Marriage and Family Therapist with over 25 years of experience helping individuals, couples, and families. Her primary focus has been relationships, helping people find the delicate balance between the drive for personal growth and the desire for a fulfilling relationship. Her other areas of expertise include premarital counseling, family issues (included blended families), anxiety, and depression. In addition, Ms. LeBoy works with a family law specialist to help couples achieve fair, low-cost, marital dissolutions. Plan to attend an upcoming workshop. T he normal life cycle contains predictable periods of life disruption. For example, when we move from childhood to adolescence, everything we had previously known about the world goes through a jarring transformation. During this period of life disorganization, our bodies go through tremendous hormonal and developmental changes, our definitions of other people change, our motives and interests change, we learn how to define ourselves as individuals with autonomy, and we expand our range of social relationships. Similar stages of disruption occur when the adolescent moves into young adulthood, and then into a permanent relationship, possible parenting, middle age, and then retirement and aging. These periods of transformation can induce potent emotional reactions such as depression, anxiety, loneliness, and anger. Those who lack resilience find these changes to be a struggle. Others welcome the changes and move through the transformations easily and naturally. Other periods of disruption can be caused by unexpected events that turn life upside down. An automobile accident, an illness, the death of a loved one, divorce, national tragedies, acts of terrorism, war, natural disasters such as floods or hurricanes, the loss of employment, and financial upheavals can challenge our ability to cope. Any of these can become “make or break” situations, depending on the degree to which resilience comes into play. We all have the capacity to reorganize our lives after a disruption and to achieve new levels of order and meaningfulness if we know how to activate our resilience. In fact, in order to mature through the process of meaningful change and reintegration, we may need to experience life disruptions. In other words, life disruptions are not necessarily a bad thing because they help us to grow and to meet future challenges in our lives. During the depths of chaos we are vulnerable because we do not know what lies ahead – but as we learn and adapt during the chaos, we prepare ourselves to meet further stresses in the future. The failure to pass successfully through any cycle of chaos and stress may leave us crippled with regard to future life disruptions. All of us can learn methods to become more resilient. Sometimes, however, our lack of closure on previous life experiences blocks us from adapting to new periods of stress as they come along. A woman, abused emotionally by her father in childhood, for example, may have great difficulty in accepting his death if she still carries unresolved conflicts surrounding the early abuse. By working with a professional psychotherapist or counselor, she may be able to achieve some closure on the abuse from her childhood and this would open the way for her to accept his death more readily – that is, with resilience. Similarly, a man who was exposed to physical violence in childhood may find it difficult, because of his unresolved issues with anger and victimization, to accept a national trauma such as a terrorist act. He may continue to dwell on issues of anger and injustice for months after the event, to the detriment of his job and family life. Again, working with a trained professional can be the route for this person to gain closure on his unresolved issues and to work toward a more integrated approach regarding acts of violence in the future. Those who are resilient seem to believe in the basic goodness of the world and trust that things will turn out all right in the end. This positive attitude allows them to weather times when everything seems bleak and to look for and accept the support that is out there. This approach toward the world gives them the ability to hope for a better future. Some people can deal with pain better than others, and this may have a biological component. For example, some can deal with the dentist without any difficulty, while others dread having a tooth drilled. The same holds true with emotional pain. Some people can tolerate anxiety and others become incapacitated in the face of stress. It is encouraging to know that, with the help of a professional therapist and some practice, one can learn to deal better with emotional pain. Biology is not necessarily destiny. Sometimes we look at situations in a way that keeps us stuck in a negative thinking pattern. Those who are resilient have the ability to look at the situation in a new way (this is called “reframing”) that can minimize the impact of the trauma in their thought process. One benefit of working with a therapist during a life disruption is that new and more objective definitions of the traumatic situation can be developed and this opens the way to handle the crisis more successfully. Resilient people take a creative approach toward solving a problem, reinterpreting old definitions in new ways. One of the best ways to endure a crisis is to have the support of another person who can listen and validate our feelings. Knowing that others care and will come to our support lessens the feeling of isolation, especially when tackling the problem alone. It is important to be selective in choosing people to trust, and no one person can be expected to be the perfect means of support. Often it takes several friends, each of whom can provide different kinds of support. Resilient people are proficient in making friends and keeping them. They have the judgment to know who their friends should be – as well as the ability to give and take in their interactions with others. Resilient people seem to have a feeling of independence and a sense of their own life in perspective. They do not feel that they are at the mercy of forces that aim to crush them. When they see a problem, they tackle it – because ultimately they know that their survival and the integrity of their life values depend on it. They have a sense of personal responsibility and the self-discipline it takes to accomplish their goals. While they have a sense of their own independence, they also have the freedom to depend on others, setting appropriate limits on their dependency. 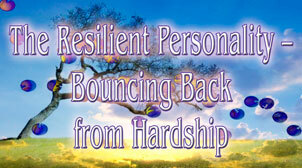 People who show resilience generally have been treated with appreciation, care, and love from early childhood on. They have learned to see themselves in a positive light and to see themselves as people who deserve to be treated with respect by others. When a life disruption creates a challenge to their self-image, they are able to restore their feelings of self-esteem quickly. Without a positive sense of self, some people find themselves stuck in a crisis, often secretly feeling that they deserve the negative experience which has transpired in their lives. Fortunately, positive self-esteem can be reinforced in therapy. Resilient people have a capacity for learning. They are able to talk about their lives, their experiences, their thoughts and feelings. They can provide a coherent autobiographical account of who they are. They have the ability to develop an objective explanation of their strengths and weaknesses. One of the goals of therapy with a trained professional is to provide the person with the ability to reflect on their lives and, from this self-reflection, to develop insight into their current life circumstances. Rather than feeling defensive about their life circumstances, they are open to new ideas and are flexible enough to try new tactics for dealing with problems. Resilient people are able to learn from their mistakes, and they do not punish themselves because they have made them. People who show resilience in the face of adversity are those who have a diversity of interests in their lives. They are open to new experiences and ideas. Because their lives are rich, they can draw on a variety of experiences when their lives are disrupted – a hobby, a different group of friends, a talent. They can find relief from the singlemindedness and worry which often accompanies a period of crisis. Finally, they can laugh. Humor has both psychological and physical benefits in relieving the stress of trauma because it encourages a swift change in our perception of our circumstances – and when our thoughts change, our mood follows. When a person undergoes a life disruption, it may not advisable to take medication that will alleviate the pain immediately. When pain is alleviated with medication, the person’s motivation to make changes is reduced. And there is a great deal to learn from the process of managing emotional pain. (Of course, there are times when medication becomes necessary, especially with the suicidal thinking that may accompany a major depression. Many other life crises can be endured better with the use of medication. This is a medical decision.) When you undergo a major life crisis, you need time to gain insight into what has gone wrong and achieve integration again. Emotional pain, while unpleasant, serves its purpose, just as physical pain does in alerting us to something that is going wrong in our bodies. It prompts us to take action. Similarly, drugs and alcohol may help to alleviate emotional pain – but then the opportunity to learn our life lessons vanishes. Reinforcing pain chemically may allow old patterns of behavior to continue – in which case, paradoxically, the pain you are trying to escape will persist into the future. Pain spurs us to learn new ways of coping. First is diversion. Sometimes we need to remove ourselves physically or mentally from our emotional pain for a while. We can take a weekend trip, read a book, watch an engrossing movie, talk to a friend, take a walk or get some other physical exercise. Diversion allows us time to heal and it may give us sufficient distance from a problem that we can come back to it again and perhaps see it in a new light.